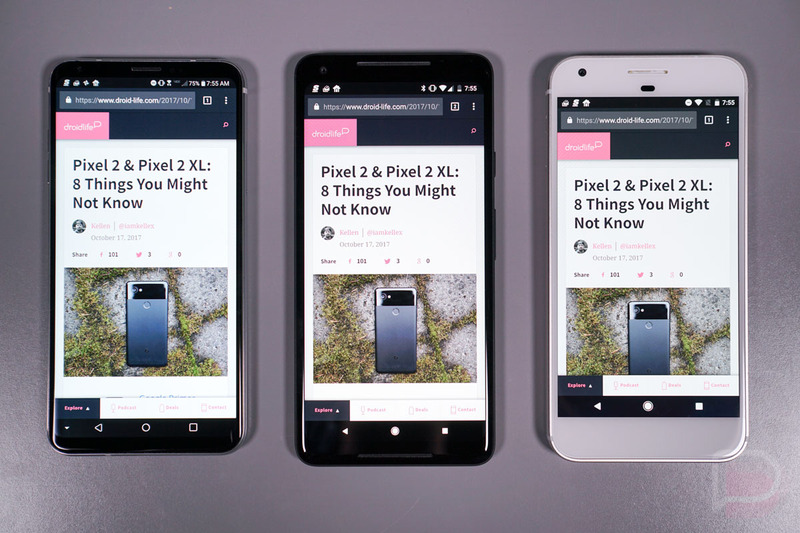 On Tuesday, within hours of the first wave of Pixel 2 and Pixel 2 XL reviews being posted, our inboxes, YouTube comment sections, and various other online forums filled up with questions about the display quality in the Pixel 2 XL. Not the Pixel 2 – the Pixel 2 XL. Some initial reactions to the Pixel 2 XL’s 6-inch POLED were not kind as they pointed out what some may consider to be unforgivable flaws that a person may not ever be able to un-see. We were initially not going to say much about it until our review, but the situation has turned into a full on -gate at this point and figured it was time to address it. Plus, we want our inboxes back to normal. So what’s the deal with the Pixel 2 XL display? Umm, it has a couple of issues. Do I personally think they are dealbreakers? Eh, I haven’t been overly offended at this point, like others, but I do fully understand how some would complain and worry about what they are seeing from an $849-$949 phone. Display quality is a pretty big deal! For one, you’ll notice that as you tilt the phone to the left or right or look at it from an angle (like if it were lying on your desk to the side), you’ll see an almost-instant blue tone taking over the display. You won’t notice it for the most part with a dark background or app up, but with a light background on the display you will see it without a doubt. Another way to describe this would be that if you aren’t looking directly at the display with it also facing directly at you, you may see a weird color shift to a cooler temperature. 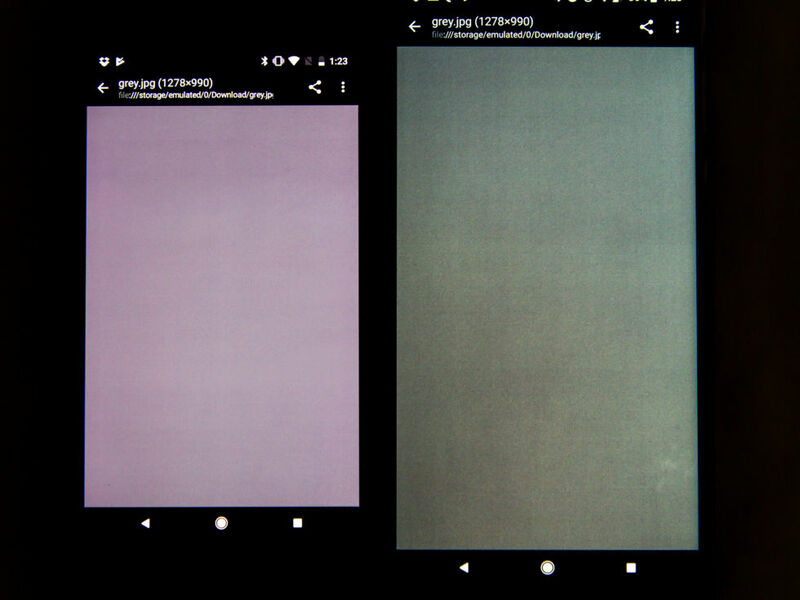 The problem here has to be the LG POLED display being used because the LG V30, which more than likely uses the exact same panel, produces the exact same effect. I have a retail Verizon LG V30 unit right here, and yes, it does it as well at a similar angle. A couple of days ago, just as this display fuss was beginning to make the rounds, a reader of ours suggested we check for an sRGB mode on the phone to see if it was possibly toggled to ON. After doing a quick search from the phone’s Settings, sure enough, we found it, but Google has blocked us from accessing it. That’s odd, since it does show up in a search. However, if you head into Developer options – the spot it is on the Pixel XL – you won’t see it listed. Google buried it and more than likely enabled it out of the box. I’m inclined to believe that it’s on because if you enable it on the original Pixel XL, it shows a similar color profile. That color profile is dull to the extreme when compared to it being off. Now, Google said that they tuned the displays on these new Pixel 2 phones to be much “more natural and accurate” than in previous years without the vivid colors that you might prefer. What you get then is a move away from the punchy or color-forward display experience you are probably used to, especially if you are coming from a Samsung phone. You’ll notice it as well should you be jumping from an old Pixel to another. Is there a fix for drab, lifeless colors? There is a “Vivid colors” toggle in the display settings of the Pixel 2 and 2 XL, but I’m not sure it does anything. I’ve toggled it off and on numerous times and can’t tell a difference. If there is one, it’s incredibly subtle. Instead, I think Google needs to give us access to that sRGB toggle, so that we can turn it off and choose which display setting we prefer. The other big complaint we have seen talked about is this potential issue where the display looks grainy or dirty when in dark situations. I don’t know that I’ve noticed this, so maybe that’s because I don’t know what I’m looking for. But in general, the takeaway is that when brightness is very low, you may not see the greatest picture in return. As I mentioned above, the Pixel 2 XL uses an LG POLED display, a type of display that LG attempted to make a few years back, but hasn’t necessarily pushed forward again and onto a meaningful phone until now. I’m not saying that LG has no idea what they are doing, just that in the grand scheme of OLED smartphone displays, I’d say they are a handful of years behind Samsung’s OLED technology. After all, Samsung has been fine-tuning this stuff for as far back as I can recall and is often given credit for having the best displays on the planet, whereas this is kind of new start for LG, in a way. I’m not trying to give LG an out should the panel in the Pixel 2 XL be to blame for everything above, I’m just letting you know what we’re working with here. If anything, their OLED panels should get better and better now that they are back to using them in flagship phones and that Google has reportedly made a big investment in production. While that doesn’t do much for the Pixel 2 XL, it at least gives us hope for the future. UPDATE: Reddit user ShortFuse wrote up a lengthy explanation of his findings after doing some digging and major research into the Pixel 2 XL’s display. You should read every single word of it, because it’s an excellent dive into what Google may be doing here and why it’s triggered some early complaints. My understanding is that Google has set the default color space in Oreo to be sRGB or “low.” They are then allowing developers to establish the color space that their apps should be displayed at, whether that’s sRGB, wide color gamut, or HDR. At this time, no one has really built out anything, so we’re seeing an sRGB color space across all apps, hence the muted, more natural colors. In theory (or the long run), Google doing this could be beneficial. It’ll allow developers to really customize the viewing experience in their apps. Unfortunately for now, nothing is ready and so we’re all staring at everything in sRGB. Some may like that, while others have expressed clearly that they do not. So Google should give us an option to force a wide color gamut and start adding that to their own apps. Again, go read the full write-up as it is excellent. I initially shared some thoughts on Twitter yesterday about this whole deal and still feel the same way for the most part. Basically, I’ve had the phone in my hand for a week and have used the sh*t out of it (7 hours SoT the other day!). While I certainly noticed the color shift to blue when the phone isn’t situated at the perfect viewing angle, I don’t know that I was offended at any time. I tend to like looking at my phones directly at all times, not at odd angles – call me a weirdo! Again, the blue tint shift is there and I don’t know that any Pixel 2 XL phone doesn’t have this issue, you just need to decide if it’s that big of a deal. To me, it’s not. As for the less-than-punchy colors, I’m not seeing this as the ultimate dealbreaker either. And I say that because, again, I’ve been using the phone for more than a week and didn’t once say, “Man, the colors look terrible here and Google and LG should be ashamed and I don’t want this phone.” In fact, I thought to myself that the display looked fine and am only now seeing the huge difference since I’ve compared it to other phones while writing up this post. In other words, I don’t know that most people will care unless they are doing some deep dive display comparisons to their old phones or are a display freak. And it’s fine if you fall into that category, I just would think that most people will come away thinking this whole situation is fine. If anything, I would hope that Google might give us back that sRGB toggle after this backlash. I have a good feeling about that fixing the color reproduction complaints. It won’t fix the blue tint, though. Should you cancel your Pixel 2 XL pre-order? I don’t think so, no. At this point, you should receive that order, take the phone for a spin, and then decide if these problems are going to be dealbreakers. You can always return these things. In the end, you are still getting the best software experience and arguably the best camera in all of smartphones, stellar battery life, and 3 years worth of major software updates.